But yes, I’m still very 9 months. The strange part is I’m already very dilated but not having any contractions. It’s getting tight in there. And definitely not on account of this place. Okay, it’s totally contributing. But totally worth it. And I really can’t complain. Many women go past their due date and then some. My body’s feeling good. But is it weird to be walking around at a 4.5? I swear this baby’s gotta pop out of me at any moment. At least I’ve had extra time to enjoy last-minute maternity purchases…. And now excuse me while I go run 5 miles, to stir things up. Though I would like to get things moving over here. I’ve got my finger’s crossed for this weekend. But maybe I’ll see you on Monday…. I just have to say you are beautiful to begin with and you are just rocking this pregnancy! You look so great! Im very jealous as i looked like a close relation to shamu and people on a DAILY basis thought it was a good idea to ask me if i was having twins, ugh. You look Amazing!!! Here’s to hoping you meet your baby soon! 4.5!!! Oh, man. I’d be on pins and needles. 🙂 Here’s hoping things start moving along soon. Lots of prayers for a quick and easy delivery for both you and baby! i can relate to the baby posting stuff!!!! its weird, how much i feel connected to all these blogs i read!!! i L O V E the no solicitating sign!!!!!!! i really laughed at that!!! good luck with baby!! and u look georg, btw. im looking for those shoes after work!!! You look adorable! In that last picture, all I see is a grown-up Lucy! Enjoy all the pre-delivery pampering. You deserve it! You look amazing! And I love seeing your pregnant updates. Could be that I am pregnant and feel the love, but I get excited just looking at your cute bump. And 4.5??!? Holy guacamole! Can’t wait to see your sweet baby. You just keep on posting those baby updates! I’m 36 weeks and the sooner your babe comes, that means the closer I am! 😉 I need all the encouragement I can get at this point. I’m 36 weeks too. Oh man, I feel like there’s a bowling ball on my bladder (also TMI?). So yeah, I could use some of that encouragement too! I went 7 days over my due date with 9.5 lbs baby! For that I am telling you this story : ) that happened yesterday morning…you better be careful my cousin in Boston just had her third child at HOME, yikes, and NOT on purpose. She was waiting for the sitter to get there when she started to have contractions and then BAM “HONEY” Her husband called 911 and they talked him through delivering their baby! Talk about a nightmare. Everything went well they got momma and 9 lbs baby girl to the hospital. PS momma is only 5’4″ double yikes. I had a sister in law go 11 days over…. yuck…. While my other sister in law had her 4th two weeks ago. She didn’t think her contractions were real ones yet and and hour realized it was. Super fast. At home. 4th time all went well. no 911 calls for them. She delivers at a birth center anyway. Midwife came and all was great! That baby slide out! oh I can’t wait!!! you’re killing me over here. I thought you for sure would have had that little peanut by now. 4.5? that’s nuts! you seriously look great though! You look great!! Fingers crossed baby comes soon! Dana, you look great, and your right, I’m a good friend you’ve never met (wait, did that sound creepy? ), but I have been waiting for a baby update! And don’t worry about the dilation, and lack of contractions, my third was easier by far, so that probably just means that the delivery will be that much easier! Is your plan to continue to blog again at the same pace after the baby is born? I just want you to know that if not, we would happily grant you maternity leave 🙂 As long as we get you back! I love the baby details… and you look great. We are all connected, and sharing “real” is the best part. But WOW, you’re at 4.5… what “station” is the baby is at, any effacement? Those are my three favorite numbers when my due date (or someone else’s) is hovering. When she comes, I think it will be a quick one. And that’s always nice, right? Happy and safe delivery to you. Seriously Dana you look fab! And I have been checking your blog every day. Hoping for an easy delivery for you. Good luck! You really look fabulous. Your smile (always wonderful–pregnant or not) is icing on the cake! Every pregnancy for me, around 36 weeks I’m walking around at a 4 and they start to tell me, “make an appointment for next week, but you probably won’t need it.” It’s awful. I dilate early without feeling it. Last pregnancy I even was sent home from the hospital at 38 weeks at a 5 with active labor (!) because I wasn’t progressing quickly enough. The next week I went in again, and they almost sent me home AGAIN! I think crying and becoming very upset pushed them into feeling sorry for me and breaking my water. Baby number 3 is now on the way (in June) and I’m trying to prepare myself now for letting him come when he wants. I don’t mind the baby details – wish you good luck with this last part of the pregnancy, it gets heavier by the day, I remember. My baby boy was born last year (my third child) after 41 weeks and 3 days. Hope you won’t have to wait that long, and wish you a good delivery, not too quick, not too slow! I don’t know how you can be full-term and still look so great. Such a nice, cute belly! With my DD, I was at a 3.5 (not as exciting as 4.5) without any contractions, but I went four days past the due date. Amazing that you can be two weeks early and so ready to go! Good luck – hope the delivery is super smooth. Maybe you’ll just keep dilating and baby will roll right out. I just stumbled upon your blog recently, but had to comment because today is 38 weeks for me too!! Tho’ I’m def not dilated. 🙂 We had a little scare last week and thought we might be meeting our little girl early – thankfully all is well and she’s still safe inside, but man, let me tell you, I’m on pins and needles now, after thinking she was going to be in my arms! Waiting can be so hard, but we will both have babies sooner rather than later! Happy 38 weeks to you!! Oh and you look fabulous too!!! I too was watching No Big Dill like a hawk, and I’m thrilled you’re giving us updates! 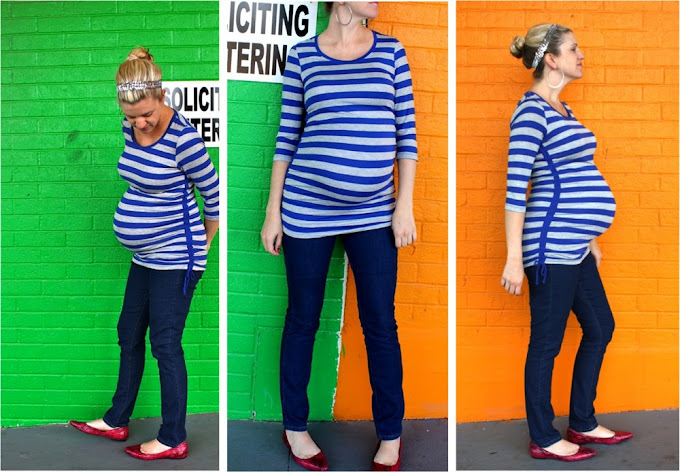 Pregnancy looks great on you — you carry that bowling ball beautifully. Can’t wait for you to meet the little one, and for your kiddos to meet their baby sister. So excited for all of you! I totally get what you’re saying about waiting for the baby updates! The countdown is ON! I went to 40 weeks with my youngest and Castor Oil helped! I’m 38 weeks and 3 days (due Valentine’s Day), so I know how you feel! I was having a ton of contractions from weeks 35-37, then they suddenly stopped… so disappointing! I’m walking around at a 3 and crossing my fingers that this little girl gets here soon – race you to the delivery room! Ah, you are so cute. Hoping it’s this weekend for you!!! Love that shirt on you, also! I’m also around 38 weeks my due date is Feb 12th. When I went in for my appt on Wednesday I was only at 1 cm. lol but that’s how I was with both of my previous pregnancies. With my last labor I went to the hospital and they didn’t want to admit me but I refused to leave. They made me walk around for an hour. They reluctantly checked me again and I was at 4 and in very active painful labor. I swear my baby girl arrived with in the hour. You look so cute! Good luck. I’m at 33 weeks, but the dr., get plenty of contractions…but thankfully not dialated. 🙂 With my first, after three days of labor the most I ever dialated to was 5 and ended up with a C-section…so way to go for already being there. I bet your labor will go fast. Can’t wait to see a baby update on your blog. AND, holy smokes!!! 4.5! I knew there was something I was forgetting to comment on! i´m totally coming here every day to see baby progress… and you have no idea I exist somewhere in the world… and I followed Drummer’s coming in to the world story…. so I get what you mean! Keep us posted, please. Since you´ve got 2 super cute kids already this little girl is promising. hahah once you’ve been pregnant, I feel like that stuff isn’t TMI. While we’re at it, I was 80% effaced and dilated at a 4.5-5 for months, without feeling anything!! AND I was on bed rest for 2 months! I thought hey, labor should be a breeze, I’m already halfway there! Sorta true…. 😉 Good luck!!! Actually I am waiting for baby-news as well every dayd when I check the rss-feed. No worries about too much information. My bestfriend was due two weeks or something my godchild decided to get out there. Good luck. You look great. I keep popping over here to see if there is a baby yet too! For my 3rd – a boy (born Sept 2011) I went past my due date. My girls were both 10 days early. I remember bouncing on an exercise ball for a whole week. 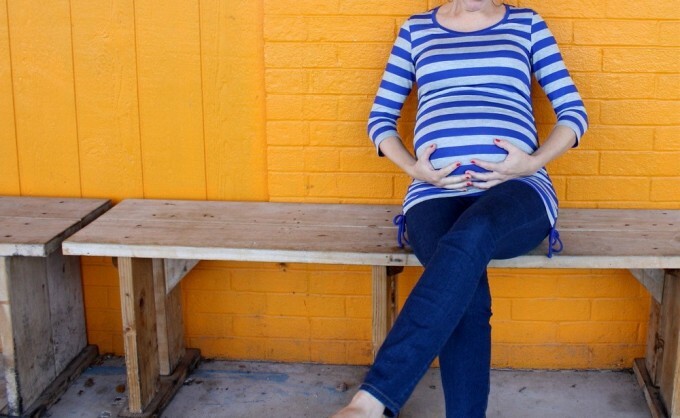 I even tried every pregnancy food to induce labor and blogged about it. Good luck! Okay, first it is totally fine to be obsessed with checking up on cute things like babies. I know I do it to your blog like once or twice a day… Second, I hear you on the whole baby come out thing. I was due on Sunday, and still no baby…Third, you are an amazingly cute pregnant lady. I mean seriously you are incredible! Thanks for the update, Dana! I kept checking your blog feeling like I had missed some note about you going into labor. Uhh… not in a stalker way, just in a blog friend way. Haha. You look amazing for 42 weeks!! Hope she arrives promptly and quickly! Why oh why do people say ‘I can’t believe you haven’t had your baby yet’, as then it gets our hopes up, that we must be having it soon…. And then the other common, oh you won’t go longer than your first babies… Sooo not true. My second came later (but faster). I hope you don’t go crazy in your last few weeks like I did 😉 all the best! I’m two weeks behind you and I swear I am twice as big. Love the shirt, it is so long, all my shirts are too short! I splurged and bought 2 spandex-y tank tops from Motherhood Maternity a couple weeks ago and they thankfully keep my stomach warm and covered. Good luck, try and get some rest although that is nearly impossible when you have 2 kids! You made me laugh !!! It remembered me when I was pregnant of my 2nd baby !! I went one night t the hospital…for nothing, had to go back home…and oh yes I did walk the 5 miles !!!! You might effectively be 5 on monday !!! So have 5 my friend !!!! estas muy guapa y te deseo un buen parto , me encantan las cosas tan prexiosas que aces con la tela , la ropa para niños te queda fatastiica , perdoname que te escriba en español pero no se escribir en ingles , quizas no puedas entender esto jejjejeje , te digo desde ESPAÑA ,a traves de made y en facebook , mucha suerte . I was 5 cm at my 38 week appt with my 3rd. My water broke that afternoon, fingers crossed its soon for you!! The beauty was my labor was only 1.5 hours after having such a head start lol. The best thing I did to get things going was walk…a lot. It also helped in early labor to walk. I agree, despite not meeting in person, we are friends. I was with you checking on Katy’s progress, and have been watching and waiting for your good news, too. Wishing you a happy delivery soon. You look AWESOME!!! And I love hearing preggo stories, its such an exciting, emotional time. With my second child I tried EVERYTHING to get him out and the only thing that worked was scheduling an induction date…never fails 🙂 Same thing happened with my first! We made the appointments and low and behold the babies came on their own. Congrats again!!! You look awesome! I was at a 7 with my second when I went in for a regular check up and my dr. was like…uh, we need to get you to the hospital. My body refuses to go into labor on its own. I just posted a DIY maternity jeans tutorial on my blog today made with Forever 21 jeans and they’re really, really comfortable. After reading that the official maternity ones aren’t, I’m glad I didn’t order them! You look so cute!! I am 39 weeks and dilated to a 2. So it sounds like you are further along than me! I am having a lot of contractions though!! Good luck!! Hopefully your baby comes soon! My first waited until the day before my due date to show up (I was not even close to being dilated a week prior), my second I had to be induced at 37ish weeks because of blood pressure issues. So It just goes to you that sometimes babies can come when they want to! I’m sure in the next few days your baby will come out. Being that far dilated will help too! Oh, the feelings of, “Will this ever END?!? !” You certainly look amazing. What a cute little bowling ball! I totally didn’t look anywhere close to that cute when I was 38 wks with the last two–you’re killing me! Hoping good hopes for you for over the weekend; can’t wait to see the new cutie-patootie! Wow, 4.5! You weren’t kidding! Well, I guess at least once your body starts pushing you won’t have long to wait. Thanks for keeping us updated. You’re right about all of us wondering what’s going on in the baby front even though we haven’t met. So keep it coming. Both of my babies had to be induced after my due date so it is great that yours will most likely be coming on her own. You look great by the way! you look amazing Dana! I’m not to far at 36 weeks pregnant due Feb 29, Leap day. My DH wants me to hold out till that day so bad, as for me, I am so uncomfortable, so huge and so wanting all the stares to go away when I walk into the gym like I shouldn’t be there. One gentleman even said that to me last week. And I barely walk at a 3. But you seriously look great and love hearing about your prenancy updates. Hoping you have a speedy delivery! Please keep us posted. You look really good! I too keep checking in to see if there is baby news so I love the updates. If you don’t post for like a day I think “Oh this is it!” Then a see you on Pinterest or something and know no baby yet. I had to be induced with both of my sets of twins. The doctors finally felt sorry for me at 38 weeks! I was huge!!!! Isn’t this the farthest you’ve been? I was induced with mine at 41 weeks. But the drugs are what made me dialate past a 2. You look GREAT! Closest I ever got with my 5, to a due date was 1 week ahead of time. One was 3+ weeks early. My sister…..went over due with all 4…..and had to be induced. Yup….she hates me! Good luck this weekend. I have gone to dr appts at 5-6 cm 80% and not having any contractions. So yeah, you can walk around pretty dilated for a long time. Lame… hope your baby comes soon! 38 weeks and you are the cutest thing that I ever did see! Seriously. So glad you updated! I’ve been waiting for the “baby post” since LAST weekend. 🙂 4.5 is exciting! Almost halfway there with no labor! Woo Hoo! I was 8 days late with my 1st, and 15 days late (yes, 2 weeks, 1 day) with my son…so at 38 weeks I still had almost a month to go! Lucky you. Happy laboring!! Someone told me a foot massage would start contractions. I was skeptical but tried it and had my baby that night (one day before due date). Good luck! Best of luck! I dilated early with all of them — early as in several weeks before I gave birth, not early as in go to bed rest do not pass go. My labors are very quick and easy, but I do get nervous about making it to the hospital in time. My littlest (4 months now) was later than the other kids had been. I was miserable, but I did take the time to go out to lunch alone with my 2-year old a couple of times. It’s my favorite memory from those last few weeks, just savoring the alone time that we don’t have as often now. And eating La Madeline’s tomato basil soup, that’s nice, too. 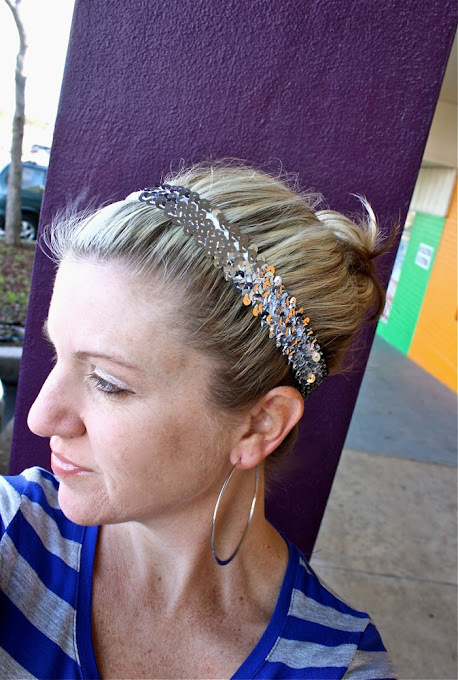 Anyway, love your blog, you look fabulous, and labor should be a breeze! Hang in there! My little #3 is now 7 months and oh how I’d love a few more days of having her all to myself in my belly. 🙂 She will be in your arms soon enough. Thinking of you Dana! I hate those last weeks, so I’m sorry you have to be there right now… but I’m very excited to see your cute baby! Good luck! I’m a week and a half behind you, and SO ready. I love that cute H&M shirt, by the way… I don’t think the H&M near us carries maternity. Maybe I’ll have to go to the farther one and see what they have. You look AMAZING!! I walked around at a 3-4 for a good 4 days before the contractions started. Hopefully it’s soon for you! The normal gestation of a baby is 9 months our time. Remember that the average month is not 4 weeks but 4.3 weeks. In the lunar calendar, which runs on 4 week months, the gestation is 10 lunar months or 40 weeks. 40 weeks is considered average so anytime between now and the next two weeks good things will happen. I wish you a gentle delivery and a healthy baby. You look fabulous!! I’m making another one of your awesome circle skirts today for my daughter’s v-day outfit! Thanks! you are alllll baby!! Soooo cute! 🙂 Hoping this is the weekend for you too! I went 11 days late and early would definitely been better! I walked around very dilated for about 4 weeks. And when it did finally happen, things went very fast! I went to the hospital to get checked when I started spotting and when they hooked me up to the monitor my contractions (which I hadn’t even felt yet) were two mins. apart! I hope you have the same kind of luck. Can’t wait to see your new little lady! You are right, I don’t know you and yet I feel I should write to you. Like you I was dilated and the baby was engaged when I was 38 weeks pregnant. the mid wife told me to go home and arrange childcare for our first child. And yet, like the first time, I ended up being induced at 42 weeks !! Good luck ! You look gorgeous and bloomingly healthy ! I hate to tell you, but I walked around at a 4 for 5 weeks!!! Finally my doc induced me a week and a half after my due date. Made for a very fast labor though. 🙂 This happened with all 4 of my pregnancies… except the last one she induced me a week early and he weighed over 10 lbs. yikes! There is no way your tiny belly has a 10 pounder in there. You look so darn cute. Good luck! Can’t wait to find out the little darlings name. Please don’t sneeze unless you are next to the hospital! lol have an easy time of it and let us know how you are when you can find a minute. we’ll be right here. You are rockin’ the belly at 38 weeks! 4.5 not too bad, my girlfriend is a nurrse and was walking around for 2 days at 6-7 cm! Amazing watching your family grow, I love your blog 🙂 Hope to see pics of baby soon. You are seriously one of the most adorable pregnant girls out! You look amazing and I love the baby updates. It is funny how you can feel so connected to people you’ve never met. Best wishes the next couple of weeks! Sadly, yes — it’s possible to walk around at a 4.5! I was stuck at a 4 for a MONTH with my 2nd baby. Unfortuantely I *did* have frequent contractions. I was kept on bed rest, given the injections to help improve baby’s lungs, etc. then when they stopped it all they expected baby to come any day. Nope! It wasn’t until they gave me an epidural (doc fudged things a touch to let me deliver since the pain was so bad I was vomiting). As soon as I didnt’ hurt any more I was complete in just an hour or two and baby popped right out! I’ve been keeping an eye on your baby progress (like a creeper *sigh*, but in all the best ways) good luck! You look adorable!! I had my third, and last, 17 month ago. I still can’t believe she’s that old. Can’t wait to see the new sweet baby girl. Totally–every post I keep thinking: did she have the baby!? And that was a really cute valentine shirt for Lucy… but thanks for the update! I totally recommend a long walk (shuffle/waddle) or two. It made it happen like nothing else for my first. Someone else I know swears by bouncing (yep) on the edge of the bed to move things along. I have been checking in every day to see if you have had the baby, just like you did. Lol! You look fantastic – I am sure that you are the kind that will ping right back into shape as soon as you have the baby. (Grrrr, not like me!) Wishing you a lovely end to the pregnancy and good luck with the birth! Sorry you’re still ‘here.’ Hopefully you can get some good R&R in. You’re so adorable! Hope your babe comes soon! 4.5 with no work is a blessing from God!!!!! Go with it! It’s like an awesome (not-so) secret that you got half-way there with minimal work at all! You look great! On a side note- I love the hoops. I wore big earrings the whole time I was preggo with mine just cause I knew there would be like a year when I couldn’t. They made me feel beautiful while I was huge. I know how you feel. The waiting seems to take forever!!! You do look amazing though. With my youngest the doctor checked to see how dilated I was and asked if I wanted her to “strip my membranes” I said sure why not. 5 hours later my water broke( just a trickle really) and we were headed off to the hospital to meet our bundle of joy! Good luck the babe will come when she is ready. Keep the baby news coming!!! You are 3 days behind me in pregnancy. I’m dilated to 3 cm & was headed to the hospital with contractions at that point with my first. & that was 2 weeks early. Now it’s the waiting game for both of us but I will be jealous if you have your baby first. :). I’m ready to meet my little boy. i stalk your blog everyday 🙂 and everyday i hold my breath if you’ve had that baby yet! You look wonderful! Good luck getting that baby out. I can’t wait to see her! You’re a darling young woman with such a beautiful family. Everyone is so eager to hear about the arrival of this precious gift from God who will very soon make an appearance. I enjoy your blog without end; the content, the photographs and the instructional format are supberb! Thank you for all your efforts. Promise you’ll keep us posted. I actually feel like a Grandma to be. Bless you. cannot wait to hear all about it and see that baby! Not tmi at all! I am like you, I keep checking to expect to see pics of your new little bebe 🙂 also I walked around with my first son at 6.5 cm for 6 wks!! I was like hope I don’t sneeze ha! Good luck! The next full moon is Tuesday, during mid-day. I don’t think the full moon thing is too scientific, but that’s exactly when my baby came, just over 2 years ago. So I bet you go before then, but at 4.5, heck, I’d be surprised if you make it 24 more hours. Good luck! Ha, ha Dana…I came here to “check” on you : ). From all of the posts and comments about almost being ready I thought you were further along than you are! 38 weeks? Did you go early with your first two? Just wonderin’ why you were expecting to go now…AND as if I haven’t asked too much personal information already…curious as to why your doctor checked your dilation…since you’re not due yet…just ‘cuz? Hope my questions are okay. I agree with everyone here…you look amazing and I love your enthusiasm for clothes and style while full term – you rock pregnancy! No pressure, though. Hang in there! You have a world of Moms thinking of you. Good thoughts for a quick and painless and safe birth. aaw… the dialated pregnancy walk! I know that one, not too comfortable is it? sorry you have to endure! Good luck in the next few weeks. This end part stuff can get taxing, but just remember those faces when you first meet them, so worth it!! Dana! You look so cute! I love the baby updates! With my daughter I was a 4.5 (10 days before my due date) I got my membranes stripped and although I did not go into labor I was having some pressure so I went into the hospital hoping I would just not get sent home after an hour of being watched I somehow made it to a 5 which I guess is good enough to get induced so they broke my water and 45 min later my daughter was born. So who knows, maybe you will get there soon, or have a super fast and easy delivery. Either way best of luck! Best wishes for a happy delivery sooner rather than later! You really do look great and I bet you have a superfast labor if you’re walking around at a 4.5! So excited for you to meet your new little gal! I went ON my due date with TWINS. Amazing I made it to 40 weeks with them being almost 8 lbs each! I wouldn’t be surprised if you went into labor this weekend. 4.5! Wow! And on top of all that… you look freakin’ amazing with that beautiful belly! With my first, I was walking around at 5 cm a week before my due date. The doctor decided to induce me. With all the rest (3 more kiddos, so far) I progressed slowly through the last month up to 4 to 5 cm and then I got induced. I don’t feel any contractions until I hit transition or my water breaks and usually there isn’t any time to get to the hospital at that point. Good luck! I’m so excited for you and your little family and can’t wait for an update! I’m now 40 weeks with my first and I’m so anxious–waiting is so hard. Plus, I was very into getting projects done but this week I keep hoping each day is THE day so I don’t do anything…which leads to a LOT of time to fill. I realize I don’t relax very well. Good luck! You look great! hey dana! you look great and i love your positive attitude! i know the home stretch can feel super long. i went a week past my due date with my son, but those babies know when they are ready! and if you are dilating/effacing your body is actually laboring now for you, so less work when you are in full blown labor! although, i understand the discomfort you feel. i am sure you are ready to be able to pee and actually feel relief! good luck to you, looking forward to seeing your new little one! I’m also 38 weeks and waiting…sometimes impatiently!! I hope things happen soon for both of us! Good Luck with the new one! you look incredible!! love that super cute outfit and those shoes…. gasp indeed 😉 too cute. 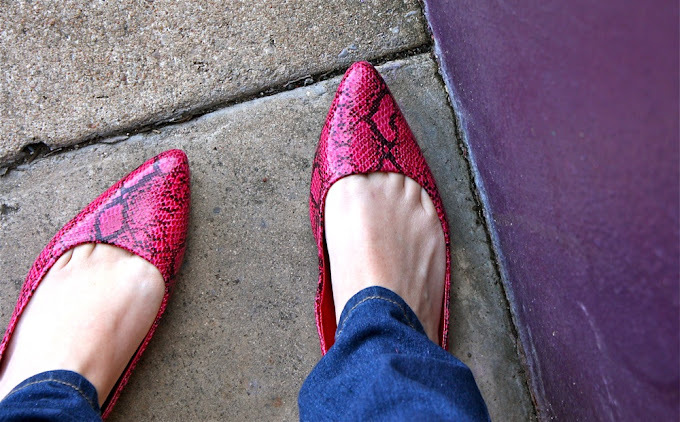 I usually stay away from walmart but may have to make an exception for some pink snakeskin shoes.. seriously 5 bucks?!?! Can’t wait to see the little one too. That baby is going to fall out one day without so much as two grunts. 🙂 I know what you mean about checking in. I feel like a stalker checking your blog (and a few other online mamas…) waiting for baby news. I myself am waiting to “pop” though I have to laugh because at 34.5 weeks, I am about twice your size (with twice the baggage!) I just can’t help but be amused. I wish you much luck, a beautiful birth and healthy little one! My thoughts are with you! I think you look great for 38weeks. All very compact!! PS: we want photos of the nursery !! You look absolutely fantastic at 38 weeks! By 37 weeks, I’m usually parked outside of the hospital beggin’ someone to have mercy on me and just give me a room! (Ha!) Here’s hoping that your remaining time of waiting is pleasant and memorable. It is NOT weird to be at a 4.5 already and no contractions. I think it’s harsh for doctors/nurses to say “ooh! you’re already at a 3–you’ll probably be going soon!” You can be dilated that much for weeks! I try to ignore such encouragement or I’d get too antsy. Of course, once it starts it will probably go fast (like everyone is saying). Enjoy your last little while with only 2! Hope all goes well with the delivery! Oh Dana, I have been checking in to see if you popped yet. Patience dear, patience. I’m in my last year of nursing school and want to be a mom/baby nurse. The longer the baby is in, the better. You look fabulous by the way. You look happy and healthy. I’m sure your children are excited and patiently waiting with you for the new arrival. I’ll be thinking of you during these last couple of weeks. We all can’t wait to see pics of the new little girl in your life. Good luck, hopefully she will come soon! You look great. Thanks for sharing. And thanks for sharing the details on your cute outfit. Good luck! You look great….heres to easy labor! I was 5cm and 70% effaced with both my children and not in labor. I was definitely having contractions…kinda like having sporadic labor for the last month of pregnancy. And when I actually went into labor it was fast. oh my gracious dana! you are walking around at a 4.5! i had to close my mouth with my hand! i hope she pops out soon! and she will pop out, possibly out of your belly button! 😉 xoxo hope you get to meet her very soon! I doubt you’ll get to the 129th comment. Totally get you. I thought for sure my third would come early and my body felt like going into labor and it didn’t! It was very frustrating but I wasn’t AT ALL dilated. I went into the hospital on my due date and they had to put the cream to soften my cervix. NOTHING. Then I was induced. My contractions were irregular and his heart rate dropped momentarily. Thought it would be c-section but it came vaginally. Turns out he had a super short umbilical cord that was preventing him from dropping. Since you’re dilated, I’m sure it won’t be the case. Good Luck!!! I’ve been checking in, just for baby updates, so keep them coming! (Although an announcement would probably be your preference!) I’m 36 weeks, and I feel that lack of space, too. So ready to meet my baby girl- I’m sure you are too! Blessings as you wait for her arrival. You look fantastic! I love the “no loitering” sign. So appropriate for baby! My second loitered for about 10 days and I did EVERYTHING I knew of to make him want out. I was within an hour of taking castor oil (had purchased it that afternoon and had it in the kitchen with instructions from the midwife) when we decided that the labor was finally taking over on its own. In fact, today our little man turns two and it was shortly after he was born that I found (and promptly became addicted to) your blog. Best of luck to you! Like everyone else, I’ll be checking back regularly! I kind of hate this saying, but you’re all belly. I’m so jealous. I was fat/swollen from my forehead to my toes! 🙂 Good luck with the babe! P.S. 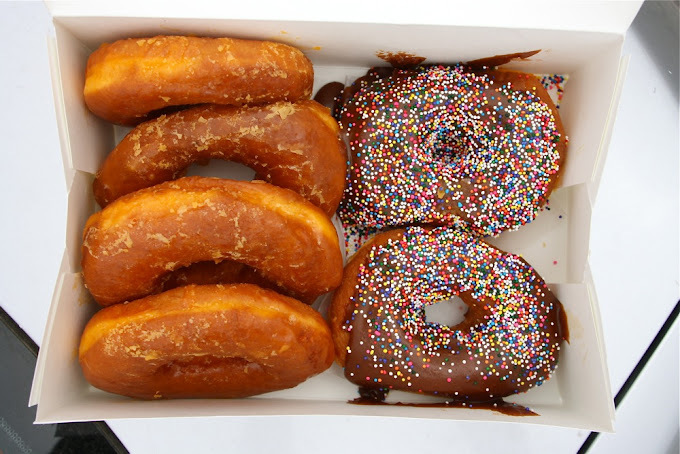 I went to RR Donuts yesterday, and man, have you had the glazed donuts that are still hot? They melt in your mouth. Love the baby updates! 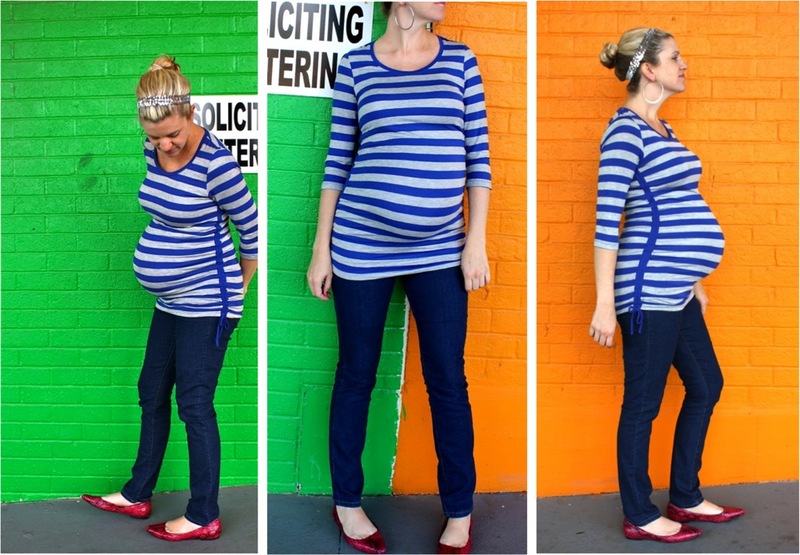 That is a great maternity shirt and it looks wonderful on you–your posts are definitely an affirmation to pregnant women that we can still look stylish. My 1st baby (7lbs) was born 10 days over and my 3rd (9lbs7oz) was 2 weeks over, but we are fairly certain the dates were probably off because of my long cycles. My 2nd baby (8lb3oz) was born the day before my due date & on my husband’s 30th birthday (best present ever) and I’m sure that he arrived a day early because my dr. “stripped my membranes” while he checked me the day before the birth. He checked me and said “whoa, the heads right there” and decided to do the “stripping” to see if it might help me progress into labor. Luckily that night my husband and I decided to purchase a coming-home outfit for the baby and I got my haircut because the next morning I woke up in labor. So I guess our babies arrive exactly when they are meant to and being pregnant with my 4th I don’t need to remind myself of that fact til July. Blessings to you and your family! Hey Dana you look beautiful ! but having “fun” with your husband can move things and make contraction. When it will be the right time for your baby the contraction will continue into labor. Any way I wish you an easy labor and a healthy baby. Can’t wait for pictures. Yours are always so good anyways but newborn pictures? Forgedaboutit. One of my friends had the same problem 4 weeks ago… And she has her baby after his husban falled down because of wait grass. She laught so so much that her baby came in 2H!!! You look fabulous! It could still be 2-3 more weeks, right? I hope not! Also, wow, does that chocolate donut look delicious. YUM! You look wonderful & all that dilation means less work you’ll have to do in labor. Enjoy & hope you have a magical birth! You look great!! Oh I can’t wait to see that little one!!! So how far are you dilated? I was 7 cm with Levi before I even felt a contraction. Even then they had to break my water… crazy! Best wishes to you Dana!! XO from nashville! Girl you look amazing! I always feel bad when I complain in the final weeks of pregnancy (like, um, right now) considering we’re expecting #4 here and I have yet to make it to my due date, so what am I complaining about?! Anyways, I love your skinny jeans and wish I could justify buying a pair just for this last pregnancy! Oh and btw I was a 4 with my son and he shot. out. of. me. so you be ready to hit the road when those contractions come. Best of luck in delivery! You and I share the same due date, and we have very similar circumstances. This is my fourth child, and with all the previous pregnancies, I went about 2 weeks early. This time, I’m fully effaced and engaged, dilated to a 4, with other symptoms pointing to a very imminent birth, but nothing for the last three weeks. Let’s share stats some time later this week – hopefully both of us will have given birth by then! jumping jacks, or maybe some loving with your hubby will help. wink wink. I have to say you look amazing. I am not even 33wks now, and much bigger than you! Your belly is so cute! Well, 4.5, this baby really going to come out any minute. I was a 6 when I was checked in the labor and delivery with my first one, without any contration! And the process was super fast. I was holding my little angel in my arms 2 hours later. So wish you a very quick and pleasant delivery. Waiting for your wonderful news! I am that girl who starts getting asked if im over-due with twins at about 7 months, so I love that you took pictures by that sign. I think next time I’m pregnant I will Need a shirt like that. “No loitering OR asking stupid questions!” My first baby I had two due dates. I went 22 days past the first due date, and 12 days past the second due date, so I truly understand feeling like you’re never gonna have that baby. But you will. Good luck! AHH! You look SO CUTE!!! Are you going to kill me if I say that you’re way too cute of a pregnant lady to have that baby? Haha! J/k. Hope she comes soooooon!!! SO EXCITED for you! I hope you’ll be on the way to deliver that sweet baby girl soon! My first two (girls) both came early– not as early as your kiddos, but within a week before their due dates. I was so sure with my 3rd that he’d come early too. so much that my husband planned his time off before the due date. Turns out I had to be induced at 41 weeks. The theory on our end was that since he had so much more room in my previously-rented uterus, he never really dropped down on my cervix. I was 3.5 cm dilated for 2 weeks and it didn’t matter, the contractions wouldn’t start. Good news was that once I was induced (in a very simple way, no pitocin) he was born within a few hours afterward. Kids are such stinkers. You just never know how things will work. Best of luck! Stop it!!! No way you only have 2 weeks to go! You look awesome. Good luck in the next few weeks with everything!! Aw, you (and your bowling ball) look awesome! Crossing my fingers for you the peanut arrives soon. I also walked around at 4.5 for almost two weeks before #2 was born. I have to say it made for the easiest labor and delivery! Watch a funny movie and LAUGH your little one into the world 🙂 or listen to Bill Cosby talk about his laboring wife…the laughter can’t hurt, and who knows–it just might help! God bless you with an easy delivery and happy, healthy baby! You still have a few weeks left! NO rushing! And yeah, I happen to check prego ladies’ blogs to see if they’ve popped. I don’t mind a play by play. I follow the Feminist Breeder and she did her birth live and I’ve even SEEN her birth on youtube, so NO I don’t mind! LOL. Hope you’re still feeling great though and have a safe delivery! Can’t wait to see baby pics, you take them beautifully! Hey, a question though, does Casey take the photos of YOU or do you set your cam up on a tripod with a timer? I’d love for my hubs to take decent pics of me, and not to think I’m some sort of vain person, so KUDOS to Casey (if he’s the photog)! You look great! Not pregnant, just like you’ve stuffed your shirt or something. Haha, is that weird to say? Oh well, cant wait to see your new little one.